Early this summer, I promised Jason Jacobs, the founder of FitnessKeeper (the creators of RunKeeper), that I would try RunKeeper for cycling. Well, it’s been a crazy summer and I just got around to it (sorry, Jason). When we spoke, Jason told me that the company’s focus today is on running, although they plan to add more cycling features in the future. 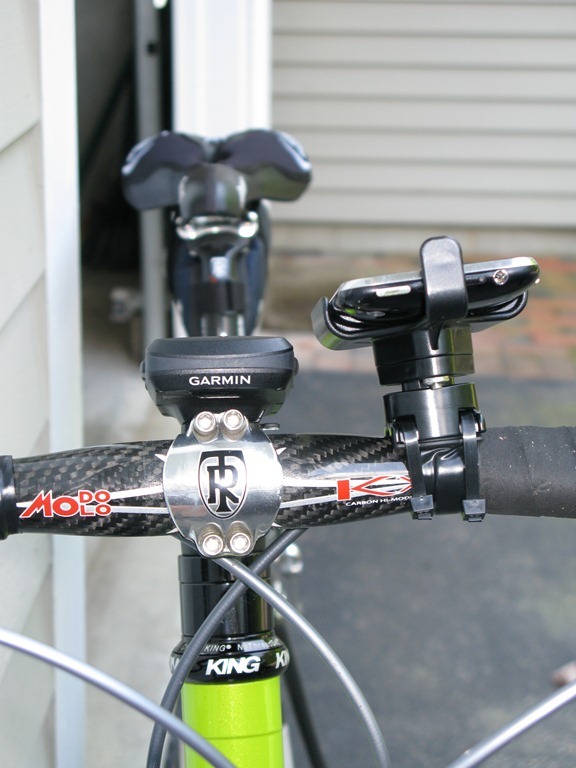 For now, you can setup RunKeeper for cycling, but it lacks several features available in other cycling computers, namely, cadence, heart rate and power (the first two are widely available, power is more rare). 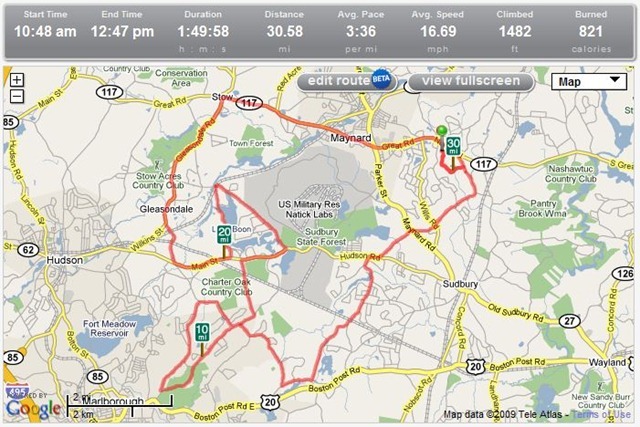 The lack of these features make RunKeeper less than ideal for cycling right now. That said, the display is big and clear with useful speed, timing and map information. 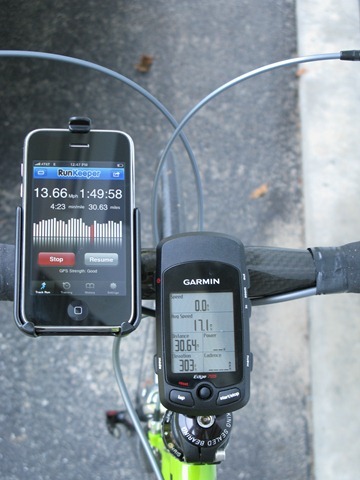 I rode with my iPhone mounted next to my Garmin Edge 705, which I’ve tested against other cycle-computers and have found it to be very accurate. The speeds shown by RunKeeper were generally close to the Garmin, but were sometimes a bit higher and sometimes a bit lower. I would assume that’s an iPhone 3G issue. 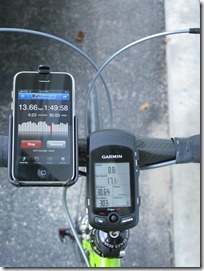 The average speed for my 30mi ride was slightly below the Garmin’s reported speed, but pretty close. Total distances were virtually identical. I liked how RunKeeper presented the data. Very easy to read in sunlight. 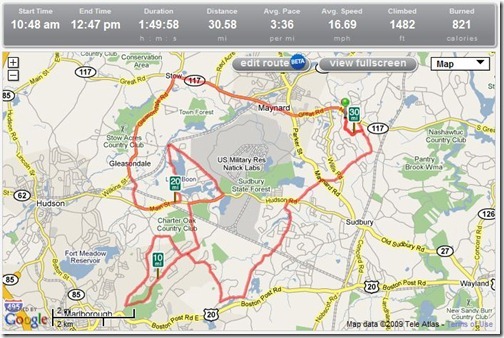 In fact, I found I was looking at the RunKeeper display more often than the Garmin’s display. That might have something to do with the screen’s size, but it seems like the gang at FitnessKeeper has put a lot of thought into how one reads data quickly while exercising. There was no comparison when it came to reading a map. RunKeeper was waaaay better. Of course, RunKeeper is online and uses Google maps, the Garmin is not connected and has all its map info on board. The Garmin map data is also displayed on a much smaller screen. Even better than the application itself, the RunKeeper website (which gets its data via automatic upload from the phone – cool) is really nice. Much nicer than Garmin Connect, Garmin’s attempt at cataloguing similar data. Mounting an expensive phone on the handlebars of a bike that vibrates on crappy roads scares people, including me. I used the RAM Mounts RAP-274-1-AP6U to hold the phone. The mount is very stable, holds the iPhone like superglue and is cheap (I think I paid about $15 on eBay). On the downside, it comes with no instructions and it’s pretty bulky. See pictures. It wasn’t exactly rocket science to install. I know that runners have been downloading the app like hotcakes. It really is very nicely done. 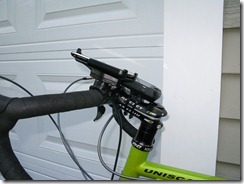 For cycling, it still needs some work and some help from extra hardware for cadence, heart rate and even power data inclusion. I don’t know if Apple has opened up the phone enough for this type of hardware to be added (a little ANT+ Sport dongle anyone?). I’m looking forward to a real cycling version. It sure would be nice to have ride data, phone and music all in one device. I agree with pretty much everything you’ve said here. I’m an avid RK user and am pretty excited about its potential. 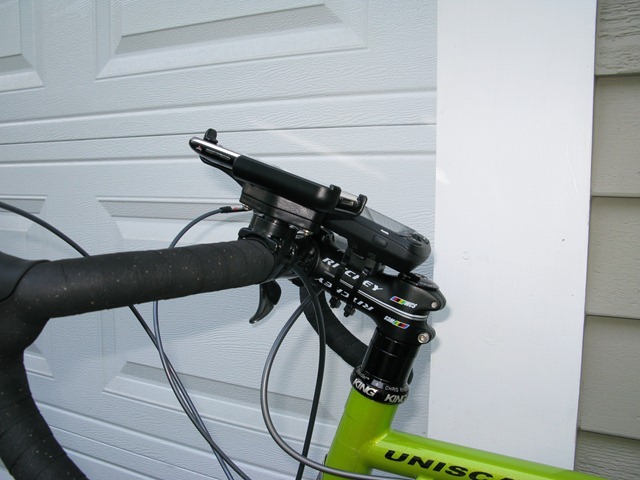 It *is* somewhat lacking as a cycling computer, but since I’ve already got a cycling computer (that does speed, cadence, etc) that stays mounted on my bike all the time, I guess I’ve looked past those short comings. For me, it’s been a great tool for just tracking my rides. To be honest, while I do like having a cadence display (I use the display setting with cadence almost exclusively on my bike computer) I’m not sure I’d really need to record that in my records. As for heart rate – yes, that is definitely needed. As I said, I think this app has a lot of potential and I think it will get there eventually. The guys behind it are really committed to it and seem to really listen to their users – that is a GREAT thing. Wow, with all that info, pretty soon it will be almost like riding a stationary cycle! Won’t that be a treat! It is a good idea to make your cycle a suer cycle. RunKeeper was waaaay better. Of course, RunKeeper is online and uses Google maps, the Garmin is not connected and has all its map info on board. The Garmin map data is also displayed on a much smaller screen. There are veterinary clinic Maltepe district of Istanbul. Provide emergency ambulanceservices to better serve you.